Most of you have noticed that a lot of motorcycles are running new L.E.D. 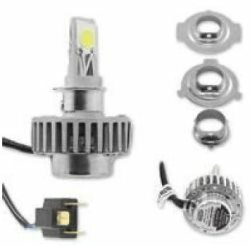 headlights, but most of you are confused as to which is the best light to run for the money. To help you out on this decision I will try to educate you on this new way of lighting the night. First of all they are nothing like the old filament type lights that we have used since the 1930’s. They now are called Light Emitting Diodes. Filament bulbs are measured by “candlepower”, LED’s use two factors, Lumens and Kelvin. Candlepower was easy to understand, the more candlepower the brighter the light. 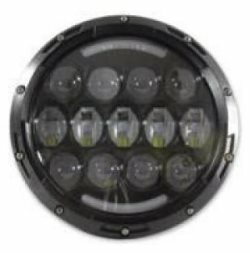 With LED lights the Kelven scale runs from 4000 to 12,000. This measurement will determine the color of the light. Knowing that 6000K is closest to sunlight, as you progress up in numbers the more blue in color the light contains, so 12000K is a very deep blue light and not very bright. Lumens are measured in watts, obviously the more watts the brighter the light. You will find that these lights can be purchased from $50.00 to $850.00 and everything in between. The cost has nothing to do with the brightness or the overall quality of the light. I personally use a LED that retails for $100.00 and is the brightest direct replacement bulb on the market that I know of. Some of the major name brand lights try to enhance the power of the light by placing them behind parabolic lenses. 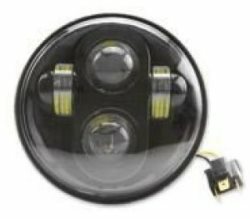 They work as magnifiers to produce a wider beam of light, some of them integrate multiple diodes to work as high beams. Hopefully this will help you see a little better at night and also help you be seen by oncoming traffic during the day. In either case if you want to improve your light, do your homework before you make a purchase, you will be glad you did.